You’d be forgiven for being a little bit concerned about The Bennies’ whereabouts lately. After being positively everywhere earlier this year and traversing the globe with an endurance and enthusiasm ordinarily exclusive to a college freshman on ritalin, the Melbourne four-piece suddenly found themselves in the eye of the party whirlwind, surrounded by an unprecedented calm. After being dubbed a 'must-see' on 2015 Soundwave Festival, The Bennies nailed triple j’s Like A Version which backed on to Golden Plains which lead into their Party Whirlwind tour which left an indelible mark on everyone’s hearts and livers. Now the band emerge from a brief moment's respite to recommence destruction with the announcement of an Australian tour right in time for summer. And true to form, they’re not doing things in half measures. After warming up at their favourite bush doof Psyfari, then playing the biggest event on the Melbourne punk rock calendar Poison City Weekender, the band will join Less Than Jake and Reel Big Fish on their east coast Australian tour in early October. They’ll then chuck a lap of the USA and visit old friends and fans at Florida’s Fest. 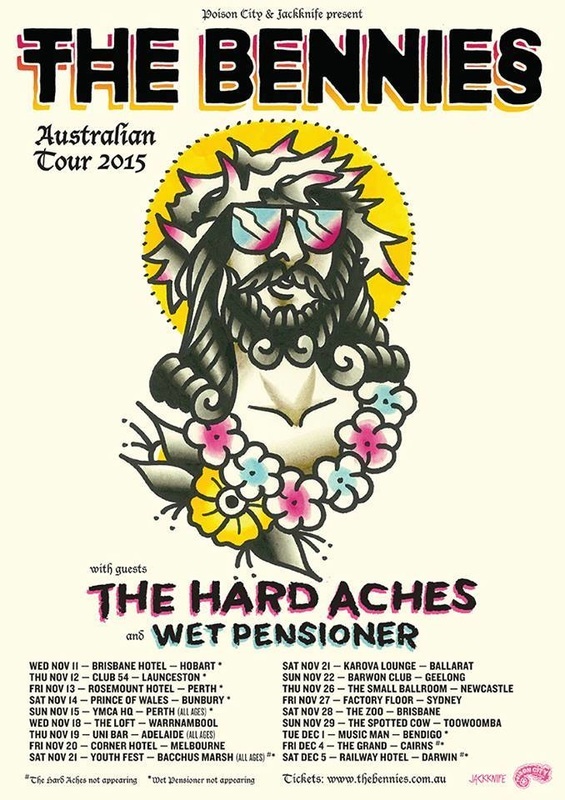 Completely disinterested in pausing for breath they’ll commence a headlining tour of Australia with mates in The Hard Aches and Wet Pensioner. This is no metro city run. Hobart, Bunbury, Ballarat, Cairns and Darwin are all invited to this veritable puff-puff-give of good music and loose times.